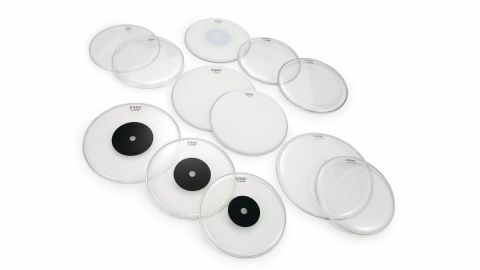 Code is a welcome, UK-based newcomer to the highly-competitive drum head market, offering a clear range of value for money heads that are designed by drummers for drummers. Code drum heads are designed in the UK by the duo of James Potts and Embrace drummer Mike Heaton. The Leicester-based company sources heads from China and Taiwan, getting them made to its own specifications. We first reviewed Code heads in March this year. Those were mostly two-ply, and now here we have the company’s range of single-ply heads. As explained in the first review, Code heads are made from industry-standard Polyethylene terephthalate (PET) polyester and follow the crimped style of construction, which entails an aluminium channel with the head material locked in by a steel insert. This method is as reliable as the ‘poured’ (‘glued’ resin) method, but it has been frequently associated with budget heads in recent years. There is, however, no reason to assume this - and the most telling evidence is to point out that DW uses crimped heads and supplies them on all its own top-priced drums. As Mike Heaton has explained previously, the company is keeping the range relatively straightforward to begin with. So Code’s answer to the industry staple Remo Ambassador is its 10-mil-thick DNA Coated and Clear lines. For hard hitters, there is the Law range which is 10-mil but with a surface-mounted 5-mil black donut dot (Remo CS style). And the Zero Coated range is the same but with a black donut dot applied underneath. For resonant tom heads Code offers the RR (Reso Ring), which is a single ply of clear 7-mil (Diplomat-weight) film with a perimeter internal dampening ring. Finally, we have the ultra-thin 3-mil or 5-mil transparent snare-side resonant heads called Genetic. As with any head company Code will likely stand or fall on the acceptance of its all-purpose single-ply Ambassador-weight Coated DNA head. So this is the acid test and it performs admirably well. It sits cleanly, rotates on the bearing edge comfortably and tunes up quickly and easily. The sound is fractionally crisper, harder, crunchier than a Coated Ambassador. This, it would seem, is the result of the coating, which has a hardy oven-baked feel. As noted with the double-ply Generator version the coating feels slightly grainier than Remo’s and makes your brushes even louder. So it is slightly different, a genuine alternative, which you may even prefer. Mounting 13" and 16" versions on the toms the effect continues, slightly brighter, with a truncated sustain. While swapping to the clear versions the sound is closer than ever to an Ambassador Clear. Without the coating, the sustain is ever so slightly increased and pure; the tone brighter. These heads would also be ideal as resonant tom heads. If you’re a harder hitter who wants the feel of a single-ply head but with a bit more longevity there’s Code Zero. This snare batter is coated but has a 5½" black donut (with central 1" hole) on the underside. The donut adds reinforcement more than dampening, although it does focus the head a little more than the DNA. Next up is the Code Law, which is the same 10mil, but with a central black reinforcing spot on the upper side, a ‘donut’, recalling Premier’s 1980s donut heads. We slapped the 16" and 13" Clears on our Yamaha 9000 toms and they both impressed with a really lively, ballsy resonance. Traditionally, the bottom side of toms have been treated to thinner heads to boost resonance. Code offers the Reso Ring (RR), which is a 7-mil clear head but with a narrow dampening ring-flap running under the perimeter. You could argue this defeats the purpose of a resonant head by reducing resonance (indeed, if you try playing these heads as batters they are really blippy). But, in fact, it truncates some sustain, which is often needed, particularly with larger floor toms. So we come to the delicately thin 3-mil and 5-mil Genetic 13" and 14" snare-side heads. Like most drummers we’re slow to change resonant heads, especially on snare drums. So here was the perfect opportunity to rejuvenate a snare that had a seriously old reso-head with dimples and nicks. And straightaway there’s extra zing and sparkle in the tone. It’s a wake-up call. Just as batters can feel comfy as they get worn-in and the sound gets fatter and more controlled, we may not be aware that the same is happening underneath. If your snare (or tom) is sounding a bit dull, don’t just change the batter, swap the reso as well. Resos being so thin, they do stretch out more and get damaged more easily, so we should pay more attention to them.